Safe and Proactive Wisdom Tooth Extraction In-Office! Wisdom teeth may have been helpful in the past, but today, they more often than not pose a problem for many patients of the Dental Center of Jacksonville. While not all wisdom teeth require removal, it’s not uncommon for them to cause issues with multiple aspects of your oral health. The good news is Dr. Landis, our in-office oral surgeon, can safely and comfortably remove wisdom teeth that pose a threat to your oral health and wellbeing. Don’t wait to get the treatment you need. Contact our office to schedule an appointment! Wisdom teeth today are considered to be evolutionary relics that did serve a purpose at one point. 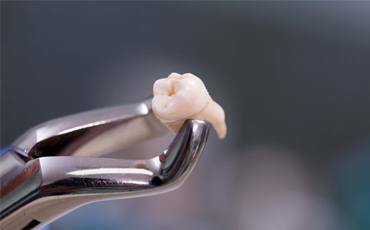 When humans were still considered hunter-gatherers, wisdom teeth helped replace molars that were lost as a result of poor oral hygiene and minimal access to certain foods. In many cases, these populations would need to resort to eating sticks and reed plants, resulting in consistent tooth loss. This is also why wisdom teeth are sometimes referred to as third molars. Thanks to modern advancements, including oral care products and grocery stores, humans rarely need wisdom teeth to replace their third molars anymore. But that doesn’t stop them from erupting. In many cases, an erupting wisdom tooth can force existing teeth out of alignment, making your bite uneven. Furthermore, erupting teeth generally result in chronic pain in the back of the mouth and even a higher risk of oral infections. This is particularly true if the tooth becomes impacted, or trapped underneath other teeth while erupting. Wisdom teeth can also become problematic if they are trapped underneath gum tissue. If a wisdom teeth poses no immediate issues or does not interfere with your current alignment, they do not necessarily need to be removed. However, their removal is typically a precautionary one and our dentists will make absolute sure if they pose an issue or not before recommending extraction. The process for removing a wisdom tooth is very straightforward. After numbing your tooth and surrounding tissue (as well as administering sedation if requested), we can begin the process of gently rocking the tooth back and forth to break it from the supportive structures holding it in place. If the tooth is trapped underneath gum tissue, we’ll make a small incision in this tissue in order to access the tooth. In more complex cases, we will break the wisdom tooth into smaller pieces to extract it that way. With Dr. Landis’ expertise in oral surgery, you can rest easy knowing that your treatment and comfort is in good hands.